The photograph shows a recent architectural sculpture by Wolfagang Buttress, commissioned by Bradford City Council. 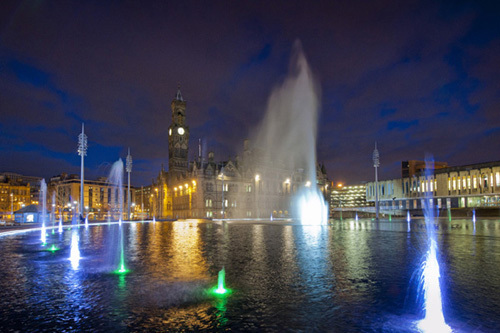 ACA were commissioned by Mr Buttress to provide a verification of the stainless steel 'trees' which can be seen to be surrounding the mirror pool. The analysis concentrated on ensuring that a light but relatively stiff structure could be achieved for the trees.